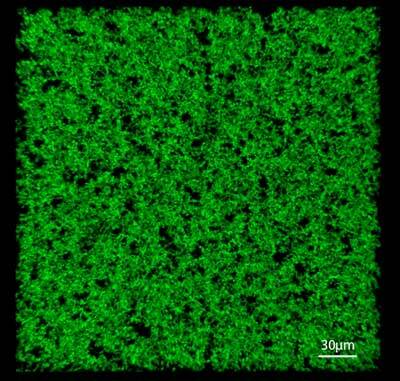 (Nanowerk News) Biomedical engineers from Duke University and Washington University in St. Louis have demonstrated that, by injecting an artificial protein made from a solution of ordered and disordered segments, a solid scaffold forms in response to body heat, and in a few weeks seamlessly integrates into tissue. The ability to combine these segments into proteins with unique properties will allow researchers to precisely control the properties of new biomaterials for applications in tissue engineering and regenerative medicine. The research appears online on October 15 in the journal Nature Materials ("Injectable tissue integrating networks from recombinant polypeptides with tunable order"). Proteins function by folding, origami-like, and interacting with specific biomolecular structures. Researchers previously believed that proteins needed a fixed shape to function, but over the last two decades there has been a growing interest in intrinsically disordered proteins (IDPs). Unlike their well-folded counterparts, IDPs can adopt a plethora of distinct structures. However, these structural preferences are non-random, and recent advances have shown that there are well-defined rules that connect information in the amino acid sequences of IDPs to the collections of structures they can adopt. Researchers have hypothesized that versatility in protein function is achievable by stringing together well-folded proteins with IDPs -- rather like pearl necklaces. This versatility is obvious in biological materials like muscle and silk fibers, which are made of proteins that combine ordered and disordered regions, enabling the materials to exhibit characteristics like elasticity of rubber and the mechanical strength of steel. IDPs are instrumental to cellular function, and many biomedical engineers have concentrated their efforts on an extremely useful IDP called elastin. A highly elastic protein found throughout the body, elastin allows blood vessels and organs -- like the skin, uterus and lungs -- to return to their original shape after being stretched or compressed. However, creating the elastin outside the body proved to be a challenge. So the researchers decided to take a reductionist engineering approach to the problem. "We were curious to see what types of materials we could make by adding order to an otherwise highly disordered protein," said Stefan Roberts, a PhD student in the Chilkoti lab and first author on the paper. Due to the challenges of using elastin itself, the research team worked with elastin-like polypeptides (ELPs), which are fully disordered proteins made to mimic pieces of elastin. ELPs are useful biomaterials because they can undergo phase changes -- go from a soluble to an insoluble state, or vice-versa -- in response to changes in temperature. While this makes these materials useful for applications like long-term drug delivery, their liquid-like behavior prevents them from being effective scaffolds for tissue engineering applications. But by adding ordered domains to the ELPs, Roberts and the team created "Frankenstein" proteins that combine ordered domains and disordered regions leading to so-called partially ordered proteins (POPs), which are equipped with the structural stability of ordered proteins without losing the ELPs ability to become liquid or solid via temperature changes. Designed as a fluid at room temperature that solidifies at body temperature, these new biomaterials form a stable, porous scaffold when injected that rapidly integrates into the surrounding tissue with minimal inflammation and promotes the formation of blood vessels. "This material is very stable after injection. It doesn't degrade quickly and it holds its volume really well, which is unusual for a protein-based material," Roberts said. "Cells also thrive in the material, repopulating the tissue in the area where it is injected. All of these characteristics could make it a viable option for tissue engineering and wound healing." Although the scaffold created by the POP was stable, the team also observed that the material would completely re-dissolve once it was cooled. What's more, the formation and dissolution temperatures could be independently controlled by controlling the ratios of disordered and ordered segments in the biomaterial. This independent tunability confers shape memories on the POPs via a phenomenon known as hysteresis, allowing them to return to their original shape after a temperature cue. The Duke team collaborated with the laboratory of Rohit Pappu, the Edwin H. Murty Professor of Engineering in the Department of Biomedical Engineering at Washington University in St. Louis to understand the molecular basis of sequence-encoded hysteretic behavior. Tyler S. Harmon, then a Physics PhD student in the Pappu lab, developed a computational model to show that the hysteresis arises from the differential interactions of ordered and disordered regions with solvent versus alone. "Being able to simulate the molecular basis for tunable hysteresis puts us on the path to design bespoke materials with desired structures and shape memory profiles," Pappu said. "This appears to be a hitherto unrecognized feature of the synergy between ordered domains and IDPs." Moving ahead, the team hopes to study the material in animal models to examine potential uses in tissue engineering and wound healing and to develop a better understanding of why the material promotes vascularization. If these studies are effective, Roberts is optimistic that the new material could become the basis for a biotech company. They also want to develop a deeper understanding of the interactions between the ordered and disordered portions in these versatile materials. "We've been so fascinated with the phase behavior derived from the disordered domains that we neglected the properties of the ordered domains, which turned out to be quite important," Chilkoti said. "By combining ordered segments with disordered segments there's a whole new world of materials we can create with beautiful internal structure without losing the phase behavior of the disordered segment, and that's exciting."